Stopping in today is a boy that I definitely fell for in a book, the kind of guy who is a bad boy by a reputation given to him, more than because of who he is. 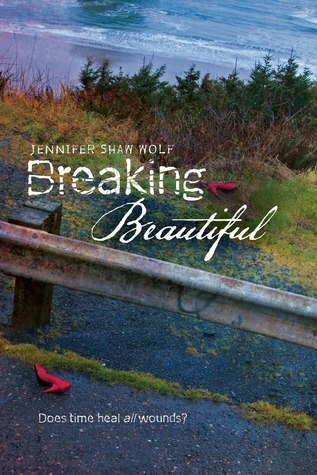 So with that, I bring you guys Blake from Jennifer Shaw Wolf's (absolutely stunning) debut Breaking Beautiful, along with your chance to win a signed copy of this book! If Allie had ended up with someone besides Trip, would you have been so hurt over not being the one to date her? That’s a tough one. We’ve always had a connection, so Allie with anyone else would have been a slam. I was completely shattered that she didn’t try to contact me the whole time I was in Nevada, because the first time I finally got the nerve up to kiss her… totally intense. But I guess I screwed that one up like a lot of things back then. But coming back to find out she was with Trip, the guy who’s made my life hell since preschool? Yeah, that was like a knife to the gut. And then he treated her like she was something he owned, something he bought with his dad’s money and could do whatever he wanted with. If she was with another guy? One who treated her decent? One who made her happy? No. It still would have sucked. Maybe not as bad, but it still would have sucked. Without spoilers, of course, what part of the book was the most intense for you? The cave. I thought it was over for both of us. Hard to save someone who doesn’t want to be saved, especially when you’re in trouble too. I’ll have nightmares about Allie’s face slipping under the water until the day I die. What's your best memory with Allie? The night before the Sweetheart Ball, when it was just me and her, before the fire and everything went to hell. That night I was finally sure Allie wasn’t just hanging onto me because she was still messed up over Trip’s accident. That maybe she could feel the same about me that I did about her. What's it like to kiss Allie? Think the first hill of a rollercoaster, when the world rushes up on you and the adrenaline kicks in and your heart is pounding and you’re not sure if you’re going to live or die, but you know its totally worth it. Then combine that with something warm and comfortable and just right, like wrapping up in a really soft blanket and knowing you could stay there forever. Like the best smell and taste and feeling you could possibly imagine. Intense, but right and sweet, and just amazing. Wish I could capture something like that in a painting. Boxers. Not going to elaborate. Thank you, Blake, for stopping in (and putting up with my questions), and congrats, Jennifer, on the release! Breaking Beautiful hits shelves April 24, and is definitely a book that you do not want to miss! Emotional and intense, but just the right amount of soft humor and sweet romance, this one is captivating from start to finish. And in case you can't stand to wait 2 more weeks to get your hands on this book (who could blame you? ), I have your chance to win it right now, for one lucky winner, a signed copy. This contest is US only, and runs through April 22. Great interview! Looking forward to this release. I am so excited to read this book! Blake sounds like the kind of character I love. This book sounds so AMAZING! Can't wait to read it!!! Thanks for you comments everyone! Thank you Kari for having me here. I loved getting back inside Blake's head for this one!